The years following the release of Star Wars (1977) were great ones for “space kids” of the disco decade like me. I always remember 1979 -- the year of Alien (1979), Buck Rogers in the 25th Century (1979-1981), The Black Hole (1979), and Star Trek: The Motion Picture (1979) -- especially fondly. In large part, this is because toy makers had, by this time, realized the full economic potential of space ship toys and products. There was a universe to choose from. 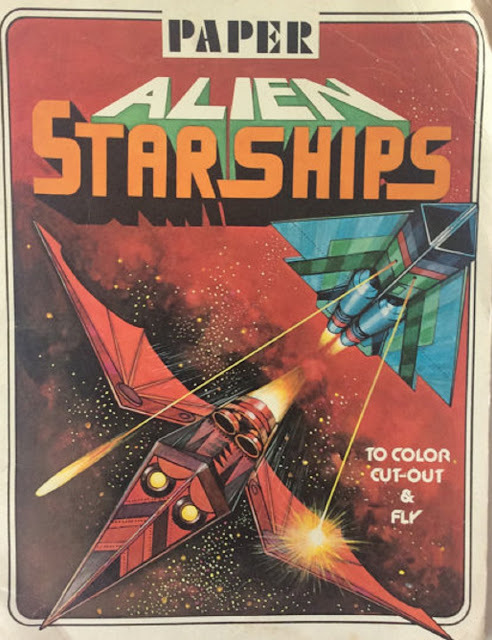 It isn’t exactly a toy, but one key product that I remember from 1979 was a slim book called Paper Starships to Color-Cut-Out & Fly, with designs and illustrations by South Korean artist Yoong Bae (1928-1992). 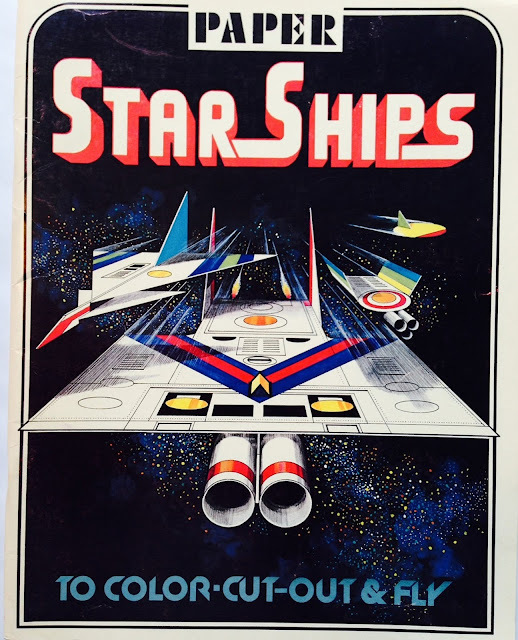 This book had a great cover illustration of a spaceship (as you can see at the top of this post), and inside the book was filled with additional designs to color and transform into three dimensional ships. These interstellar crafts had names like Jupiter 5, Capricorn 9, Venus 53, and Mars 5. I remember I had this particular book, or perhaps my next door neighbor and best friend had it. Together, we colored, cut out and brought these spaceships to life. Those ships had many a dogfight, I can assure you. 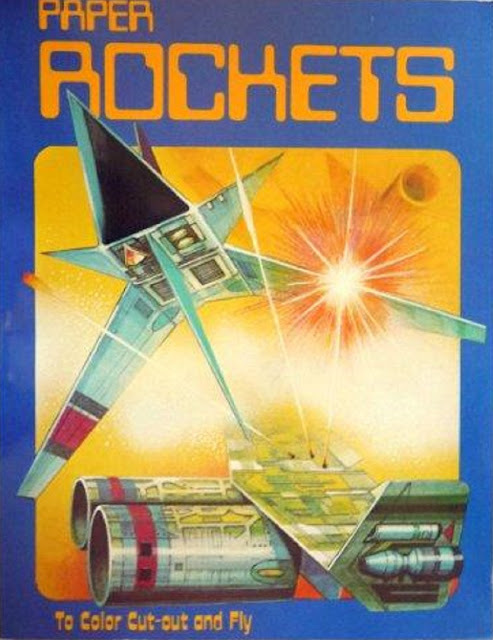 Paper Starships was released by Troubador Press, and in the follow-up years -- though unbeknownst to me – follow-up books with designs by Bae were published by the same house. There was Paper Alien Starships to Color-Cut-Out & Fly in 1980, with designs including the Beeyong Dragon, and Paper UFOs in 1981. There was also an entry for rockets, and apparently a Moonraker (1979) “color-cut-out & fly” tie-in edition too. I would have loved to have all those books. You can see some of the Paper Starship designs in glorious detail at 2 Warps To Neptune, here. Much of the content of that excellent blog has moved to Facebook (as We are the Mutants) but it was at the blog that I first had my memories of Troubador Press’s “color, cutout and fly” books re-awakened. I am grateful to the author for triggering another great memory from my childhood, and from the post-Star Wars boom.